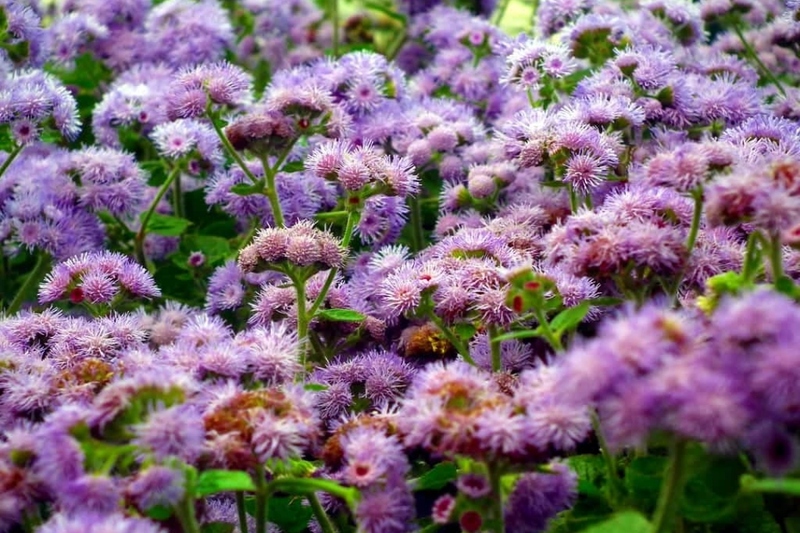 Flossflower (Ageratum houstonianum): growing, planting, caring. Ageratum houstonianum - the flossflower - is a species of the daisy family Asteraceae, native to Central America, often grown as bedding in gardens and sometimes considered an invasive weed in other areas. It is a cool-season annual plant growing to 0.3–1 m high, with ovate to triangular leaves 2–7 cm long, and blue flowerheads, sometimes white, pink, or purple. Sow the whiteweed under shelter between 16 and 18 ° C, in March-April (or possibly in autumn). Be careful, young plants tolerate a minimum temperature of 10 ° C, no less! Plant them in pots at the final location, in finely worked soil (chipped, scratched and raked), checking that the last spring frosts are passed due. Once the area is properly prepared, simply make a small hole with a dibble, remove the plant from its bucket, put it in the hole, and compact the soil to put it in contact with the roots. Respect a spacing between the plants corresponding to one third of its intended width. Water copiously to facilitate rooting. For plants with shallow rooting, simply pull on them, taking care to eliminate as much as possible roots. Otherwise help yourself with a spade. Water seedlings gently, maintaining the soil always moist - if it is in a pot, make sure the bottom is drilled. After a few weeks, watering once a week should be fine. Avoid spraying the leaves, especially for plants indoors. Water thoroughly in the summer to enhance flowering. The removal of faded flowers gradually avoids the depletion of the plant and stimulates the growth of new inflorescences. At the end of the season, leave some, to recover the seeds, or simply let them fall to the ground for the next season! Transplant seedlings between two and four weeks after planting - as soon as the plant is sufficiently developed to be handled. Carefully separate the seedlings and replant individually in a bucket filled with transplanting soil, or a mixture of soil and well-decomposed compost. Water copiously at the plantation, then every day during the first weeks. Annuals such as Agerate multiply mainly by sowing, so consider harvesting the seeds in late summer, and sow them again under shelter in March. If you do not touch the flowers, the plant can sow itself!